I love it when I get a letter from a reader that makes me really look at history in connection to my own beliefs on a subject. One reader had written a while ago to ask me about Old West style of hangings and if I thought we should bring it back? While a few places such as California and Utah executed criminals by using firing squad in the 1800s, hangings were the go to form of capital punishment in America during that time. And though that's the case, we should also recognize that hangings took place in North America long before the American Revolution. The first recorded hanging in North America was in the British Colonies. It was a cattle thieve by the name of Daniel Frank in Virginia on March 1st, 1622. The first hanging of a murderer was John Billington in Plymouth, Massachusetts. That was back on September 30th, 1630. And believe it or not, Billington had come to America on the Mayflower. He was executed for shooting another settler with a blunderbuss. If you've never heard of a blunderbuss, basically its a single shot muzzle-loading flintlock firearm with a short large caliber barrel that's flared at the muzzle. Most folks believe the blunderbuss is the granddaddy to the shotgun. That's especially true if we look at how it was used in the military and defensive use of the time. Like the shotgun, it was really effective at only short range. And here's a bit of trivia for you, the term "blunderbuss" is said to have originated with the Dutch for their word "donderbus." That was a combination of "donder," which means "thunder," and "bus" which means "pipe." Also, you might find it interesting that a blunderbuss in the form of a handgun was called a "dragon". That's where we got the term "dragoon." As for hanging a woman? The earliest recorded hanging of a woman was Jane Champion in 1632 in Virginia. I couldn't find out why she was hanged. as for the first woman hanged for murder? She was Margaret Hatch who was hanged on June 24th, 1633. Of course, on December 6th, 1638, a woman named Dorothy Talby was hanged in Salem, Massachusetts, for killing her three year old daughter. Most of these executions were for murder although a few of the early ones were for other crimes such as witchcraft and even adultery. It's said that 13 women were hanged in Salem, Massachusetts, in 1692 as a result of the infamous "Witch Trials" there. Of course, as I said before, that was before Americans stopped being part of Great Britain. Still working with British laws, the youngest person ever to be hanged by the neck until dead in America was a 12 year and 9 month old girl. Imagine that. Her name was Hannah Ocuish. She was convicted of the murder of a 6 year old girl who she beat to death. Described as a "half breed Indian," she was hanged in Connecticut on December 20th, 1786. Up to the end of the 1800s, hangings were mostly local events and not always reported by news services of the time. Some say national circulation meant that the newspapers saw it their duty to get the word out. They say because it was of national interest. Let's be frank here, the newspapers circulated sensationalism to sell loads of papers. Fact is, there was very little altruism when it came to the news media even back then. As today, the news media has very little to do with them having some sort of social conscience. They're all about the all mighty dollar and always have been. For example, the largest mass hanging in our history took place on December 26th, 1862, when 38 Sioux Indians were hanged all at the same time in Minnesota. President Abraham Lincoln himself ordered the mass hanging after the Sioux had slaughtered settlers, men, women and children. That was big news across the country. And while the basic story may have been the same, newspaper friendly to Lincoln wrote it one way while those newspapers who hated him wrote it another. If you're thinking that it was the same as how the newspaper the Tombstone Nugget reported the shootout near the OK Corrals versus how the Tombstone Epitaph reported the same shooting, you're right. Neither newspaper was very impartial. The fact that the Tombstone Epitaph survived even though they were always extremely gracious and complimentary toward the Earps makes my skeptical of most of what they wrote It's actually very hard to take whatever that paper wrote as being an unbiased chronicle of event. Then again, the Tombstone Nugget was just as bad for the Earp opposition. But as they say, the lack of professionalism and biased nature of newspapers then and now is really a subject for another article on another day. Of course, another multiple hanging that was seen as a big event was the hangings of the Lincoln conspirators. Most know President Lincoln was shot and fatally wounded on April 14th, 1865, in Ford's Theater by actor John Wilkes Booth. We also know that Booth himself was also shot dead while on the run. His co-conspirators were not so lucky in that they were quickly rounded up and tried by a military court. Co-conspirators Mary Ann Surratt, George Atzerodt, David Herold and Lewis Paine were sentenced to hang for their part in the conspiracy to assassinate President Lincoln. The death sentences were confirmed by President Andrew Johnson on July 5th. The execution was set for 1 o'clock in the afternoon on July 7th, 1865. A gallows was built in the yard of the Washington Arsenal prison, it had two trap doors and two ropes suspended above each. The prisoners were led out and seated on chairs while they were prepared. Mrs. Surratt was left to be last. Captain Christian Rath officiated as hangman. He placed a noose around each of the prisoner's necks and then put white canvas hoods over their heads. Assistants bound their arms and legs with white cloth strips. From left to right on the gallows were Mary Surratt, Lewis Powell, David Herold and George Atzerodt. At 1:21 p.m., Rath signaled to the people on the platform to stand away from the trap doors. He then clapped his hands three times. At the final clap, four soldiers knocked away the supporting planks and the traps fell, dropping the prisoners five feet. About 25 minutes later, Army surgeons certified them all dead. The Boston Post wrote, "Payne's limbs were drawn up several times, and for a moment or two his whole frame quivered violently, but within five minutes all was still. Harold struggled some and some emissions of water took place from the body such as is frequently the case with persons dying a violent death. There was no perceptible movement of the body of Atzerott, and he apparently died easy. There was only a slight movement of the limbs of Mrs. Surratt observed." With her execution, Mary Ann Surratt is said to have become the first woman to be executed under a Federal law for a crime. Now as for terrorism, it may be surprising to some to find out that its not new to America. In fact, Leftists and Anarchists have been a problem for Americans for more years than most can imagine. Anarchists seems to have appeared from the political movement that caters to the Socialist movement. Fact is hate groups are not something new. We should not think that violent so-called Social Democrat groups are something new at all. Leftists have called for murder, the systematic killing of political opponents, political assassinations, and have used violence against police for years. And no, believe it or not, Democrats calling for the assassination of President Trump in 2017 is not something new either. Democrats did the very same thing after President Abe Lincoln was elected in 1860. As for extremeists, the Haymarket Bombing that took place on May 4th, 1887, is a great example of their handy work. That sorry episode in our history took place when Leftist terrorists, anarchists, threw a bomb at police officers who were trying to control an anti-government demonstration in Chicago. That terrorist attack became known as "The Haymarket Bombing." Those murderers killed seven policemen. And believe it or not, they didn't care that they also killed four of their own demonstrators. Of course many more were injured as well. Eight of the anarchists were arrested and charged with murder. And after a trial, and a verdict of guilty was found, on November 11th, 1887, four of the anarchists were hanged right there in Chicago. In reality seven of them were sentenced to hang, but two had their sentences commuted to life in prison. One of them committed suicide while sitting on death row. The remaining four, August Spies, Albert Parsons, George Engel and Adolph Fischer were hanged by the neck until dead at noon right in front of an audience of some 200 people. "For a moment or two the men stood like ghosts. At 11:45 a.m., Chief Deputy Cahill ordered the witnesses to remove their hats and a few moments later the condemned men were led in one at a time. Each was dressed in a white shroud and had his hands pinioned behind him. The nooses were placed around their necks and the white hoods pulled over their heads. Spies said something that was inaudible, but Fischer shouted "Long live anarchy" as did Engel. Parsons began to speak but all were silenced by the crash of the falling trap, released from a booth behind the gallows. They fell four feet and twisted and writhed at the ends of their ropes. The bodies were examined by doctors and one by one they were declared dead, Fischer taking the longest at 7 minutes and 45 seconds." Now as for the main tool of the trade, let's talk about the "Hangman's Noose"? There's some question it as a few readers have written to ask how's it different. It is just a coiled noose. It was normally formed from Manila rope and has from 5 to 13 coils which slide down the rope delivering a heavy blow to the side of the neck, hopefully rendering the prisoner unconscious. I've read somewhere that a "hangman's noose" is illegal to possess on a U.S. Navy vessel. The punishment if one is found with such a noose is said to be a Court Martial. Since I spent time about ship when in the Marine Corps, I remember hearing that. But frankly, I really don't know if that's true of not. The modern noose is prepared in accordance with a procedure laid down in a U.S. Army manual on capital punishment. It states that a rope from 30 feet in length and of three quarter of an inch to one inch in diameter is to be boiled to take the stretch out of the rope. It's needed to stop any tendency or the rope coiling. It is formed into six coils and then waxed, soaped or greased to ensure that the knot slides easily. The knot is normally placed beneath the prisoner's left ear and the noose drawn fairly tight. This is so the neck will break and the guilty will not just dangle and strangle. After years of hangings, folks realized that it was necessary to take out the stretch from the rope to prevent the prisoner bouncing up again in the trap, as often happened in earlier times. In some states this was done by dropping a bag of sand of approximately the same weight as the prisoner and then leaving it suspended for some hours prior to the execution. As for the use of a hood, it became normal in later times to hood the prisoner on the gallows. The hood was either white, or more commonly black. In modern times, the hood is said to have served the purpose of preventing the prisoner from seeing the hangman pulling the lever and moving at the crucial moment. It is also said that the hood prevented witnesses from seeing the prisoner's face afterwards. It was not a pretty site. Especially if they died by strangulation. And hears a concern that it's a safe bet most did not know, it was normal to put the noose on after the hood so that the material of the hood reduced rope burn. Imagine that. During the 19th and early part of the 20th centuries, the sheriff of the county in which the defendant was sentenced officiated as the hangman. One American hangman went on to become President. It's true, Grover Cleveland was Sheriff of Erie County in the 1870's and hanged 28 year old Peter Morrissey on September 6, 1872 for murder. A few months later on February 14th, 1873, he actually officiated the hanging of another murderer. His name was Jack Gaffney. After being Sheriff of Erie County in 1871, he became Mayor of the City of Buffalo. Then he became Governor of the State of New York before he was elected President of the United States in 1884. So among U.S. presidents, he's the only one who ever hanged someone. Having the Sheriff as a hangman did lead to a few bungled hangings where things simply went wrong. For example, the length of drop was not calculated correctly, or the size of the rope was not big enough, or the rope was not strong enough for such a thing. But frankly, that's very understandable since sheriffs were not professional hangmen. A problem with a rope breaking took place in the 1876 during the hanging of James Murphy in Ohio. He was condemned to hang after stabbing Colonel William Dawson to death in Dayton. Prior to the hanging, the rope which was said to be unusually thin had been stretched and tested using a barrel of nails. Doing that apparently weakened the rope. So when the trap was sprung, James Murphy dropped but the rope snapped at the beam above him. Murphy is said to have fallen to the ground and was unconscious for a moment. But then after a few moments, people heard a groan and him shouting, "My God! Oh my God! Why I ain't dead, I ain't dead!" To his surprise, after a good rope was located and used to replace the one that broke, he was hanged again a few minutes later. The second time was definitely successful. His a hanging put to rest the notion that if one survives a hanging that he is said to have been set free. James Murphy probably heard that wife's tale and believed it up to the point of them finding another rope. No article on hanging would be complete without talking about the hanging of Thomas "Black Jack" Ketchum. In his case, his drop was too long and his extra weight hadn't been calculated into what was needed to hang him correctly. There is myth out there that says Thomas "Black Jack" Ketchum was so mean that the other outlaws in his outlaw gang asked him to leave because he was too mean. While I don't really know if that's true or not, he is said to have been as mean as they come. Along with his brother Sam, he was responsible for countless train robberies. He was by himself when he was captured during such a robbery in August of 1899. He was taken to Clayton, New Mexico to stand trial. He was found guilty and sentenced to hang. Supposedly, contrary to the Hollywood myth that every Old West town saw hangings, the town of Clayton had never seen or preformed a hanging before. It turned out to be an event that pulled in a large crowd from the surrounding area. And while local lawmen actually sold tickets to the best seating, a number of sources say that small Black Jack Ketchum dolls were sold. They were a lot like small "raggedy anne" dolls hanging from sticks. It's true. The hanging was a big event and the even all of the saloons did a lot of business that day. Spectators there really weren't ready for what took place as they truly got more than they bargained for. The town's officials had never hung a man before, and were unsure of the correct procedure. The evening before the execution, they'd experimented with the correct length of rope to use. During their practice they used a two-hundred pound sandbag to simulate the weight of a body. 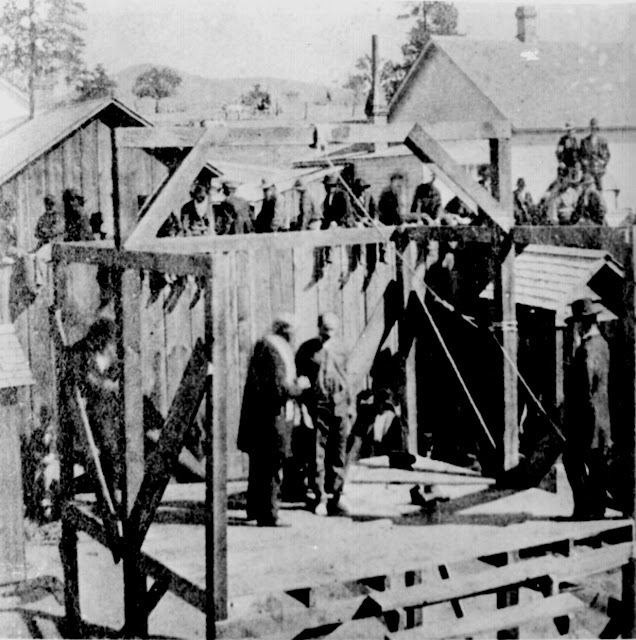 The hanging was scheduled on April 26th, 1901 at 8:00 a.m. After the initial hoopla, at 1:13 p.m., Thomas "Black Jack" Ketchum was lead to the scaffold. While they were adjusting the hood, Ketchum is reported to have said, "Hurry up boys, get this over with." At that moment, Sheriff Garcia used two blows with a hatchet to cut the rope that released the trap door. That sent Ketchum through the trap and into history. The moment that he dropped is when everything went wrong. Because no one there was experienced at that sort of thing, the Sheriff and others forgot about the sandbag that they had used to test the rope. So between all of the weight that Ketchum had gained over his time of being in jail, a rope that was too small being used, and the weight of that sandbag, that rope is said to have become as rigid as a wire cable when it went taunt. What did that do? Well, when Ketchum fell through the trap door, he was immediately decapitated. Yes, his head popped right off his shoulders. There are two stories to what happened next. One story goes that witnesses were horrified to see his head ripped from his body. That story goes on to say his head actually fell to the ground on its feet and stood up for a few moments before falling over. All of this while blood poured from the severed neck. The other story says that witnesses were horrified to see his head ripped from his body, but the only thing that kept his head from rolling away and into the spectators was the black hood that happened to be pinned to his shirt in that case. Either way, right after he was decapitated, a doctor pronounced him dead. And believe it or not, then the Sheriff is said to have ordered his severed head sewn back to his torso prior to his burial. And by the way, while some sources say he was hanged at 12:17 p.m. and others say it was at 1:13 p.m., he was buried at Clayton's Boothill by 2:30 p.m.. There is something else that should be noted. While witnesses were said to be horrified to see his head ripped off, there were some in the crowd who took the time to have their photograph taken with the headless corpse. Some of those photographs were later printed as souvenir postcards. Originals of those photographs are said to be worth more than $2,000 at auction. Why was he hung? Well, it's said that he is the only person who was ever hanged for the offence of "felonious assault upon a railway train" in the State of New Mexico. And while I don't know if he last the dubious honor or not, Thomas Black Jack Ketchum was said to be the only man in American history to be decapitated during a public hanging. Hanging was seen to be a slow cruel death as the prisoner strangled on the rope if it didn't break the neck. This led to the invention of the electric chair which came into use in New York state in 1891. Then Nevada introduced the gas chamber in 1921. Hangings became less and less commonly used in the 20th century as many states more and more used the electric chair or the gas chamber, believing that the chair or gas was supposedly more humane. And though that's said, there were 2718 legal hangings between 1900 and 1967. The last hanging under Federal jurisdiction was 27 year old Victor Harry Feguer at the Fort Madison prison in Iowa on March 15th, 1963. Feguer was hanged for the murder of Dr. Edward Bartels. In Washington state hanging still remains a legal option to lethal injection if a prisoner chooses it. I can't help but wonder if that the reason that Washington state had two hangings since 1977. Those two were Charles Rodman Campbell & Westley Allan Dodd. The state of Delaware has had one hanging since 1977. That was Billy Bailey on January 25th, 1996. Delaware now only permit lethal injection. In New Hampshire, the option of being hanged is supposedly still on the books and can be picked if it looks as though lethal injection is not practical. As I stated earlier, a reader wanted to know if I thought we should bring back hangings? To me, I'd like to see hangings being brought back into use as an option. And frankly, I don't know or care if it would or wouldn't deter capital crimes or not. What we're talking about is "consequences" for one's crimes against others. I'm not sorry to say that I could care less if some child murderer dances a while at the end of a rope. He should have never crossed the line. Like it or not, hanging as with other methods of capital punishment stops the worse of the worse from committing other crimes that violate humanity. It stops recidivists from being let loose to do their dirty deeds again. And of course, hangings will definitely stop convicts from dying of old age on death row.